A class specivically designed for piano study in a group setting of three for 45 minutes. Weekly concepts include ear training, sight reading, rhythm drills, composition, theory and performance. 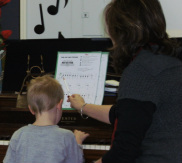 A class for young children ages 4 to 6 to experience beginning piano, singing, movement, response to rhythm, and music appreciation. –stringed wonder! No ukulele—no problem! We have several for use during class. A class for elementary students to experience singing, movement and choreography, harmony, self expression, music theory and keyboard. Several concerts and outings will be scheduled during the school year. Classes designed for parent and/or children including but not limited to music, enrichment and parent workshops (childcare provided on site). Classes will be posted in advance. Cost varies depending on time and materials. This class is designed for children grades 1-5 to explore singing, movement, performance and self-expression. Several concerts and outing will be scheduled throughout the year including a Fall concert at Bisset Park as well as Christmas and Spring performances. Come sing with us!